What if Christmas gave you what you've always wanted? Nothing beats the feeling of giving, or receiving, the perfect gift. The most meaningful gifts we receive make us feel known, loved and valued. And when we give a gift like that, it's like we're putting ourselves into our present. And at Christmas, that's exactly what God did. This light-hearted and lively book explores how our gift-giving traditions show us a glimpse of a giving God. 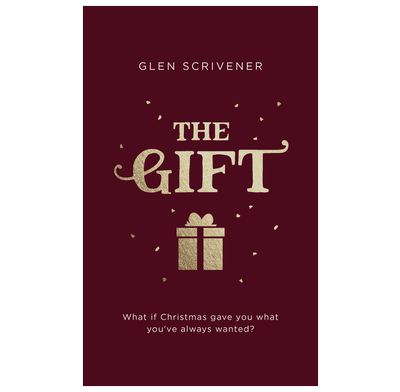 Evangelist Glen Scrivener helps readers to celebrate the gift of life in a world brimming with beauty, before taking us to John 3:16 to unwrap the Christmas gift that can give us what we've always wanted, and what we really need. This book makes an ideal gift for non-Christian friends and family, and is cheap enough for churches to buy to give out at services this December (bulk deals available). An exciting tie-in video made by Glen and the team at Speak Life will also be available for churches and individuals to use in their evangelism.